History tells us that Columbus discovered America...despite the fact that Native Americans already lived here... and despite the fact that another man had already been here from Ireland. His treacherous journey from the Emerald Isle to the Americas, or as he phrased it the Isle of the Blessed, is known as, the Voyage of St. Brendan the Navigator. St. Brendan was born around 484, near the port of Tralee, in Country Kerry. He was a holy man , a monk, and an abbot. 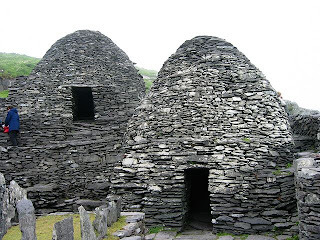 He developed several monasteries in Ireland and attracted many disciples. The most famous of his monasteries was Clonfert, in County Galway, built in 560 which lasted until sometime in the 16th century. That's almost a thousand years! 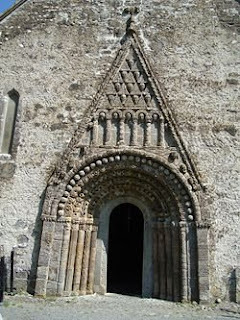 St. Brendan's Cathedral which was built in the 11th century still resides in Clonfert, and is renowned for its large Romanesque doorway. In Annaghdown, (Co. Galway), he also built a convent, which his sister Brig presided as abbess. There are many landmarks in Ireland named after St. Brendan, including Brandon Mountain located in the Dingle Peninsula, in County Kerry. He built a small monastic cell at the bottom of the ridge. It is believed he climbed this steep hill and had a vision of the Americas before he set sail. Although, he didn't know it was the Americas. He thought it was Tir na nOg, or the Land of Eternal Youth, the Garden of Eden. On the north side of Brandon Mountain lies the small village of Brandon and beyond that Brandon Bay. I have been to Brandon and climbed Brandon Mountain. My maiden name is actually Brandon, and my family came from Brandon to the U.S. in 1898. It is a beautiful little town, and the mountain really is a hill. I have a picture of myself standing atop the ridge and Brandon Bay in the background. I got to see the ancient beehive shaped remains of his chapel. Sheep roam the 3200 foot high summit. If you ever get a chance to visit Ireland, it is a must see. It took Saint Brendan 7 years to complete his journey in which it is believed he traveled to Iceland, Greenland, and the Americas. The tale describes Saint Brendan as meeting St. Patrick. He lands on an island fo Easter celebration, which turns out to be a sea monster. It was the making of such stories as The Odyssey and Pinnochio. 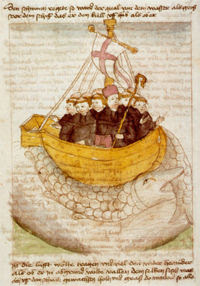 St. Brendan and his group explored the Land of Promise bringing fruits and precious stones with them upon their return. There are some who believe Columbus used the manuscripts journeling Saint Brendan's voyage to navigate his way to the Americas. Speculation also states thatVikings began serious raids on Ireland by the end of the eighth century. Is it possible the Norsemen learned about the lands from the Irish travellers? Saint Brendan is now known as the Patron Saint of sailors and travellers. Saint Brendan died in 578, at Annaghdown in Ireland. He is buried at Clonfert Cathedral. His Feast Day is May 16th, the day of his death. So what do you think? Did St. Brendan travel to the Americas before Columbus? There's an Irish pub near Penn Station called Tir Na Nog, and now I know what it means. Thanks for the wonderful post on St. Brendan. I knew about Leif Erickson's visit to the New World but not St. Brendan's. I had never heard of St. Brendan either. I really have to get to Ireland someday. And that's really interesting that someone recreated his voyage using the same type of sailing vessel. Thank you Elizabeth! Have you been to the pub yet? See now I need to look up Leif Erickson! Thank you Bearded Lady! Isn't that cool that they did that? I hope you get to Ireland someday, it's beautiful! Many times. It's beautiful inside, like a real Irish village pub. And they have live music on Saturday night. When I went to Ireland I went to a real Irish Pub in a small village in the Dingle Peninsula, and actually danced an Irish jig to a fiddle! It was so much fun. Nice blog! It's possible Columbus wasn't the first to discover America. I have heard the discussion more than once before?? I do think he made it, and if Severin's trip is any indication, it must have been quite a voyage. Have you heard the orchestral piece called The Brendan Voyage? Orchestra with piper soloist, really nice evocative stuff. I agree. I haven't heard of that orchestra, I'll have to check it out, sounds interesting! does any one know of a decent mural depicting st brendans voyage? I am named after him and am interested in finding a decent mural to add to my family tattoo. I had the fortune last week of being in Ireland. With my son Brendan, we Clonfert to see St,. Brendan's cathedral there. The day before we were at Craggaunowen and saw the Brendan boat built by Tim Severin on display. We also visited sites on the Dingle Penisula. It was a wonderful trip! it's a nice post but there is no evidence that Saint Brendan's voyage was anything but folklore. Indeed it was not committed to writing for hundreds of years after he died. The idea that the land he discovered was America is, as far as i'm aware, pure conjecture. The story is pretty fantastical, he apparently visits islands where the birds sing psalms and he passes an island of blacksmiths who throw slag at him. He even meets Judas on a rock who has been let out of hell for the day because it's sunday. I think it could be possible that St. Brendan made it to the northern reaches of New Foundland Canada. Two factors are 1) the short distances between Ireland, Iceland, Greenland, and NA. 2) The northern trade winds blow westerly, then circle around south and easterly again to Europe. Why do Americans vote on Tuesday?